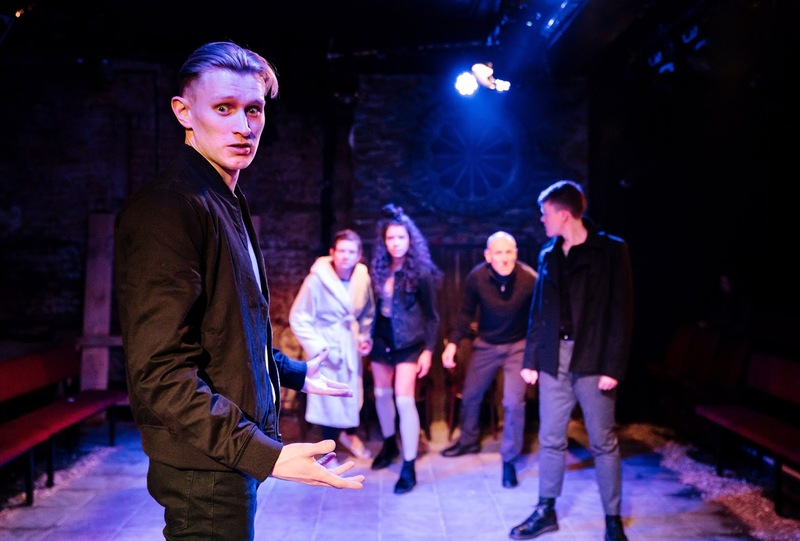 Steven Berkoff's extraordinary theatrical masterpiece East returns to the same venue in Islington forty three years after its first London production which made such an influential impact and defined a style of theatre which is both absurd and shocking in equal measure. 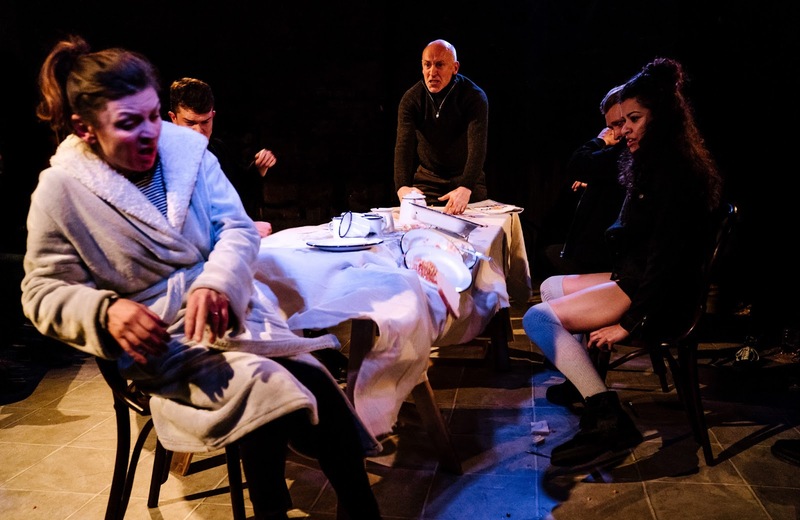 Berkoff says the play was written to exorcise demons struggling within him. 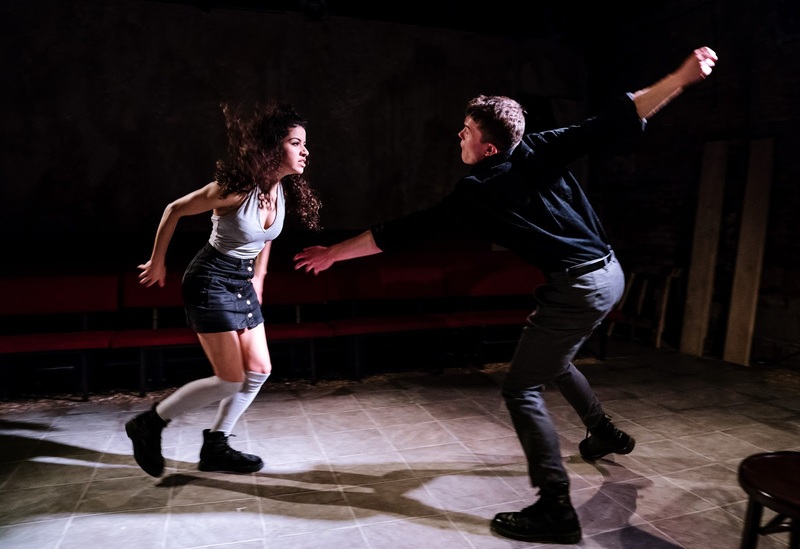 The result is a powerful explosion of feelings and emotions which contrasts the youthful exuberance of two young men and the girl they fight over with the tired martial existence of the parents they might become. The structure of the play, a series of short scenes, soliloquies and mime sequences rather than a linear plot, is exciting and demanding but in reviving it also has a sense of nostalgia with its cultural references and music that evoke an earlier post war, pre Thatcher time. It plays with the sense of time and this reinforces the flights of fantasy that some scenes explore. Berkoff's language is at times poetic with Shakespearean allusions but often course, graphic and explicit. It also feels dated in some of the attitudes and expressions used adding to the sense of a bygone era. You can't help feeling that the two likely lads at the centre of the stories might have made good today and broken free from the environment that traps them. The structure, language and tight intimate setting requires strong talented actors to carry it off as they and the audience are always conscience of each other and that this is a play. Director, Jessica Lazar is well served by her cast and the flow is enhanced by Yvan Karlsson, the movement director to create evocative pictures with a minimum of props. Jack Cordon as Les and Boadicea Ricketts as Slyv makes impressive confident professional debuts often holding our attention alone but also working wonderfully together with James Craze as Mike and supported by Debra Penny as Mum and Russell Barnett as Dad. Each has their scene centre stage but some of the best moments are when they work as an ensemble with energy and intensity. meet and fight or when Dad explains over dinner being part of a brown shirt gang; scenes of great comedy in the cinema or at Kursall amusements and scenes of sexual fantasy on the No 38 bus or Slyv wishing she had the sexual freedom of being a fella. The sharp contrast between these scenes makes this episodic and unsettling, never quite knowing what will come next. Some scenes have become iconic theatrical moments like when Craze and Cordon magically create a Harley Davison bike ride fantasy. These scenes make this a text to be performed to be understood and I am sure it will remain a staple of school and drama school classes but it is a play that has to be seen. tunes, "in the mood", "daisy daisy" and "rollover Beethoven". However the most touching and affectionate moment comes when Les and Mike sing "underneath the arches" highlighting their friendship trapped in poverty. 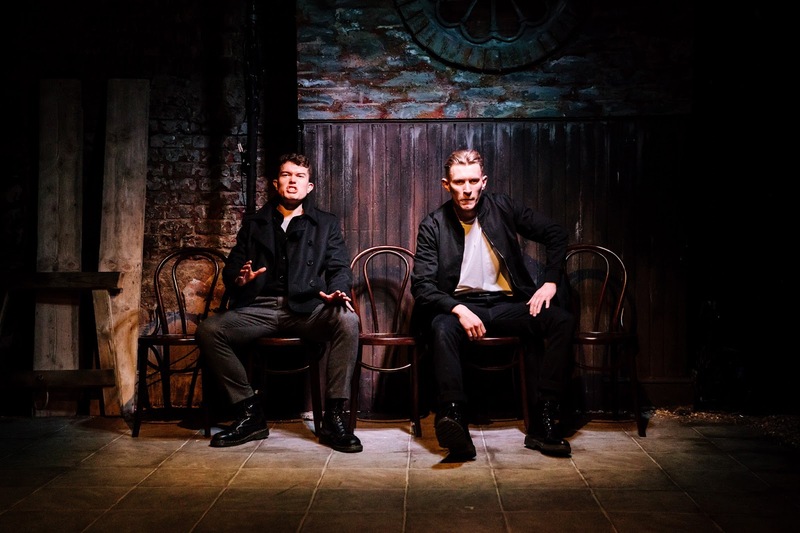 The quality of this production and of the exceptional writing makes this a must see show, evoking strong memories of a time past in older audiences and provoking a realisation of how times have changed in London amongst younger theatre goers. It is a theatrical tour de force, a piece of theatre history and a wonderful engaging experience that only the best live theatre can deliver.